I’ve been all over different websites lately and posting/sharing the links on my social media pages, but in case you’ve missed them, here’s the latest. 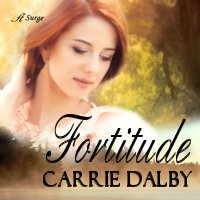 This post is a review of my historical novel, Fortitude, by MeLeesa Swann, a newcomer in the world of Middle Grade fantasy. This one is about seeking inspiration in the world around you, on MeLeesa’s site, including examples I find of Fortitude and Corroded in the world around me. Steven Moore hosted me last weekend with some great questions. Check out his website while you’re there. He’s a fantastic artist (“Mr. 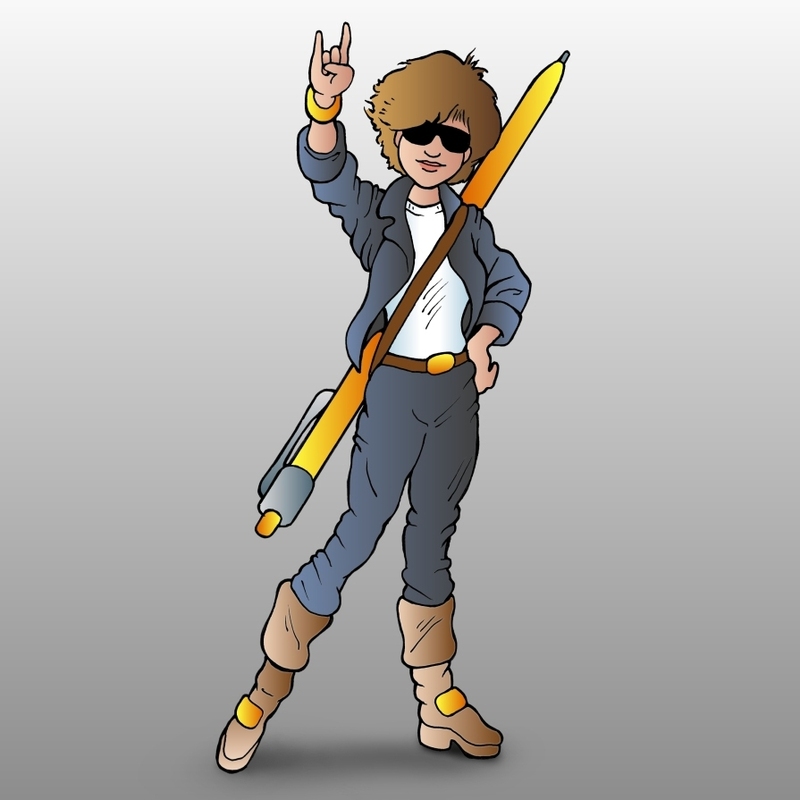 Illustrator” from The Inscribables, who drew my “Word Rocker” avatar.) If you love fantasy books, games, etc. be sure to browse his offerings. And I had another stop with MeLeesa Swann (she’s been great to me) to answer her burning questions. 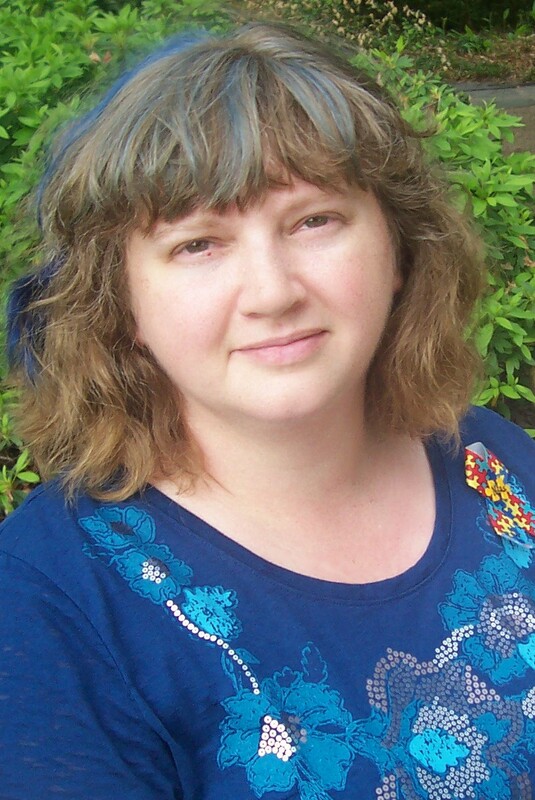 Thanks for following my blog journey and checking out my literary friends. Be sure to signup for my newsletter because BIG NEWS is coming soon! My little book, Corroded, is celebrating a year in the wild. April is Autism Awareness/Acceptance Month and today is World Autism Awareness Day: the perfect time to read (or leave a review if you’ve already read it) for Corroded. Recommend it to a friend or family member you think might benefit from or enjoy the story. While what the character Ben goes through doesn’t describe every condition/issue individuals on the autism spectrum deal with, it shines a light on the different ways people experience the world. Knowledge leads to understanding. The world needs people who understand where those who are different from them are coming from. 1. The acknowledgement section for Corroded is full of people, but the one that stands out the most is Laurie Halse Anderson. Yes, THE Laurie Halse Anderson. I was blessed to win a full manuscript critique during a fundraiser for the Joplin, Missouri tornado victims in 2011, one of the last full critiques she was able to do. I’ve been in contact with Laurie both before and after the critique and she’s been nothing but supportive. An ultimate mentor—my thanks, again! 2. Mary Weber is the character that changed the most from how she was portrayed in the original drafts. She’s stronger and more relatable than she was to begin with, thanks in part to honest critique partners and beta readers who shared their displeasure of her with me. 3. 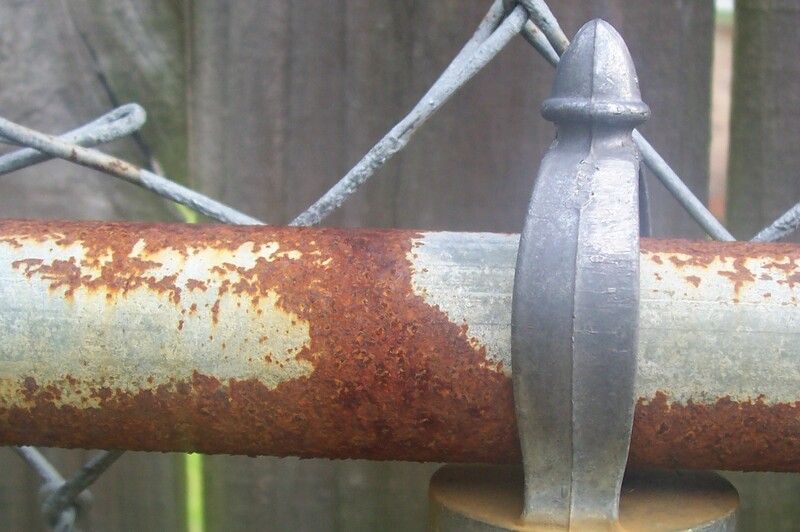 In both of my books, my secondary characters vie to over-run the main one, and Corroded is the ultimate example. Ben Thomas was so well-loved by beta readers and my critique group, the story finally morphed to include his own point-of-view chapters. 4. Ben’s sensory issues are influenced by the sensitivities of several people on the autism spectrum including my son and the autobiographical tales by John Elder Robison, Temple Grandin, Donna Williams, and Erin Clemens (who the book is dedicated in part to.) But Ben’s story isn’t a one-size-fits-all autism story. Autism is a spectrum disorder. Each person on the spectrum is unique and lives with a different set of skills and sensitivities, just like anyone else. 5. Weighted blankets can help calm people on the spectrum and other individuals with sensory-related issues. Does it work for everyone? No, but it’s worth trying because it’s a safe, drug-free option to ease anxiety and quiet meltdowns. 6. Ben originally had one obsession—The Avengers, with a focus on Thor because I’m a Marvel girl. As his role expanded, he became more complex with his interests and the history geek emerged. 7. The town in Corroded, Santo Cordero, is based on the Rio Del Mar/Aptos area in Santa Cruz County where I lived during high school. The school I attended had a Mariner mascot—that’s where the idea for Sailor Suzy came from. 8. 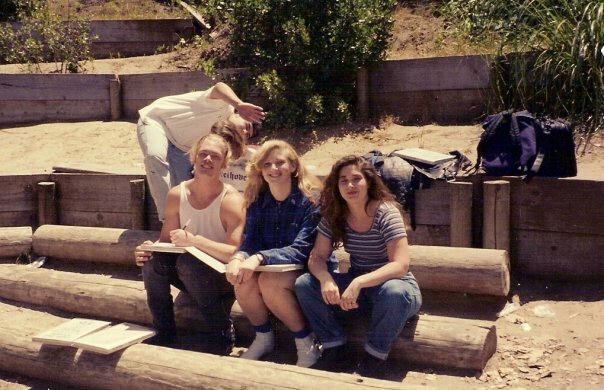 There was a place on campus called “the pit.” Photographic evidence: that’s me in the middle, rocking my flannel shirt and white moccasins in 1993. 9. I found the Steinbeck Wax Museum on Cannery Row in Monterey totally creepy when I went there, but what else could you expect from a wax museum in a basement? It did not disappoint, in that regard. 10. I have two older sisters who are much cooler and more interesting than me. While growing up, I almost always shared a room with one of my siblings, but I did have my own room for about two years before my sister closest in age moved back in and I was forced to share my space. I played up those two experiences for Mary and Barbara’s relationship trouble. No matter where you stand, education about something that touches the lives of one out of every sixty-eight people (or more) is important. 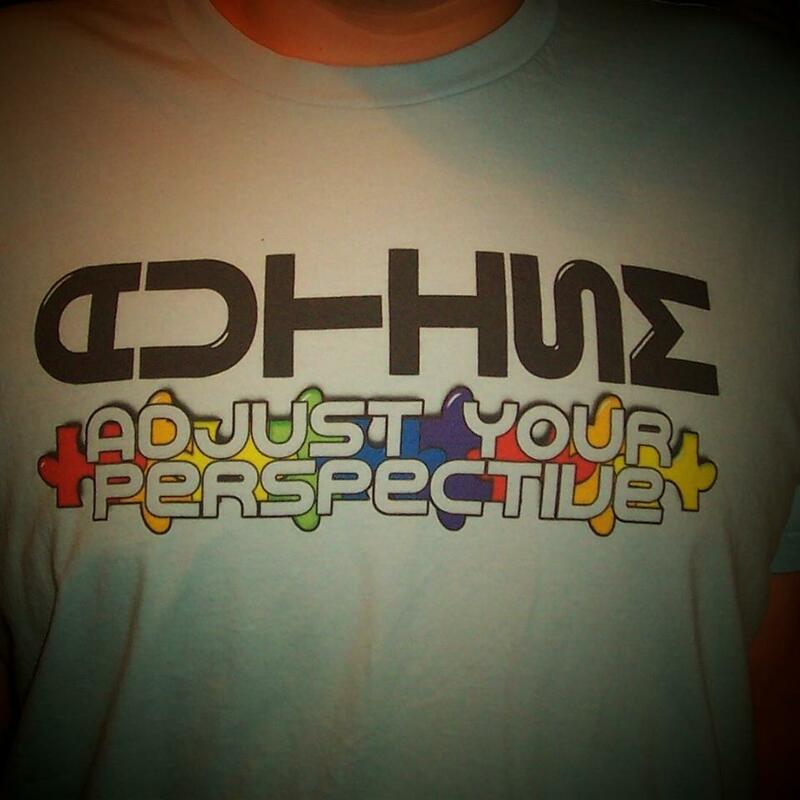 One of my favorite autism shirts. As a spectrum disorder, no two journeys are the same. The more stories the world hears, the better. Share your journey or the story of someone you love whenever possible. To read more about autism, check out the different categories of my posts in the sidebar of my website, or start here. 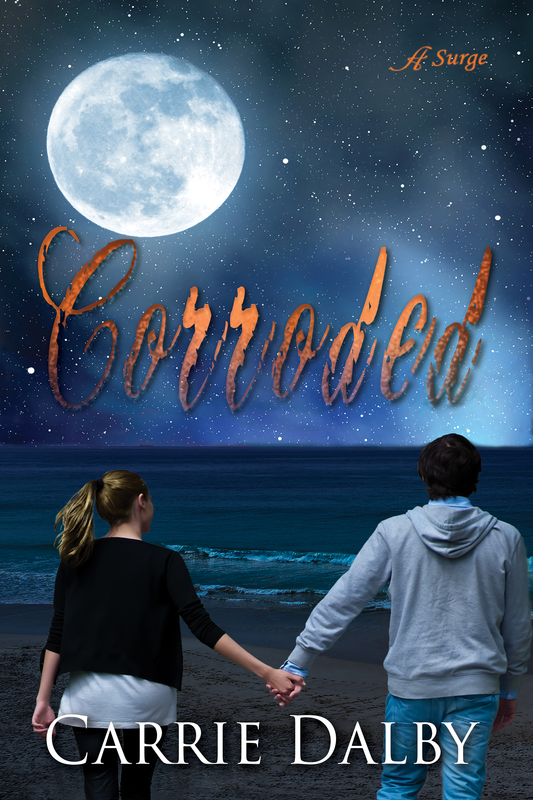 Besides writing about autism-related topics on this blog from time to time, I wrote Corroded, which releases April 12, 2016. Corroded tells the story of neuro-typical Mary and Ben, who is on the higher functioning end of the autism spectrum. I hope the book will entertain, as well as enlighten people about living with–and loving someone with–autism. Who do you love with autism? Autism Awareness/Acceptance Month is past the halfway mark. Have you seen an increase of understanding around you? My blue hair has provided more opportunities to discuss autism with others, so I’m glad I was brave enough to try it this time. Me, on World Autism Day. I scrolled through some old posts and came across this one from two years ago—the then nameless Fernando has been making an appearance on the blog for that long. This is a timely find, because it talks about my two manuscripts that are now under contract for publishing in 2016, and it explains where I got my line, “Don’t let your fortitude get corroded.” It doesn’t seem like Fernando has grown much, but it’s more than doubled in size. Fernando, before it was Fernando, April 2013. Seeing these photos today reminded me of my teen on the spectrum. Just like my son, Fernando is always responding to his environment. 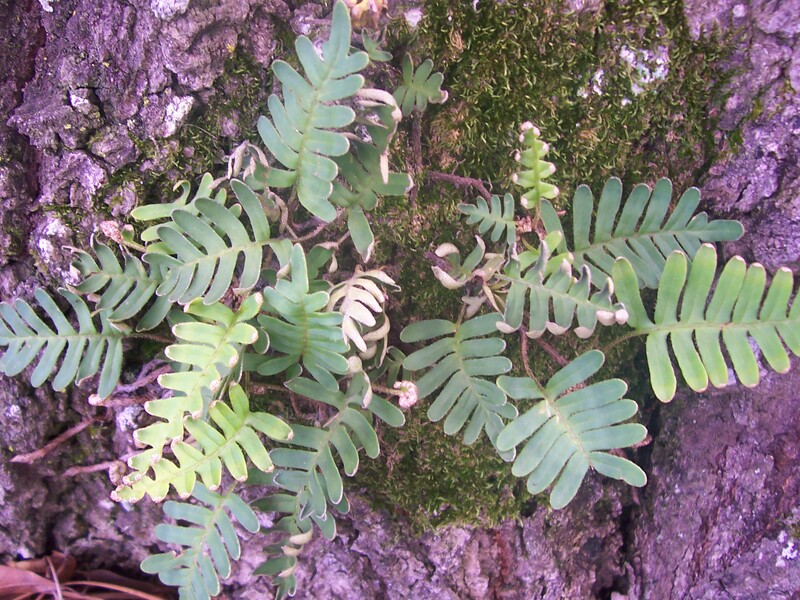 Outside stresses, like weather, can cause disturbances to growth and adaptability, while appropriate nutrients and habitat can promote expansion. Sometimes, the rate of my son’s maturing seems laboriously slow, but if I think back to how he was two (or more) years ago, I can see how far he’s come. 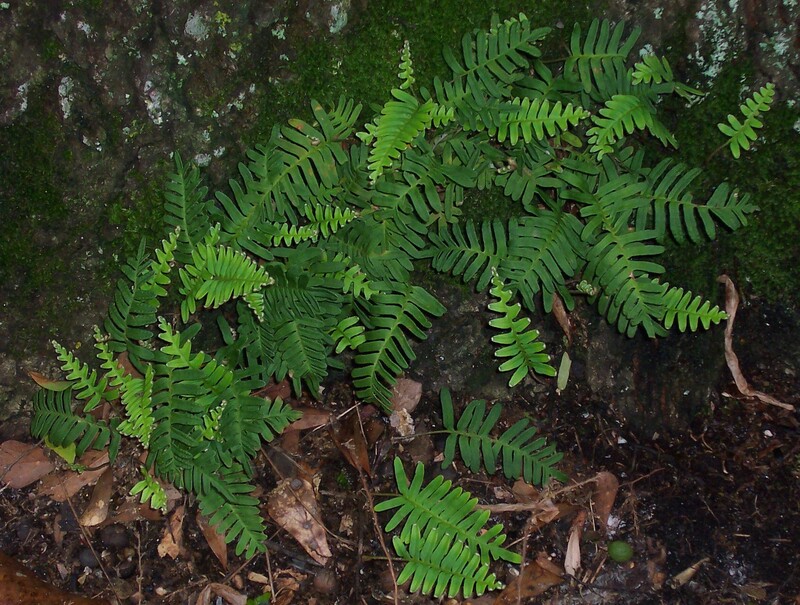 Fernando can be used as a personification of my writing, as well as a symbol of human needs and growth. 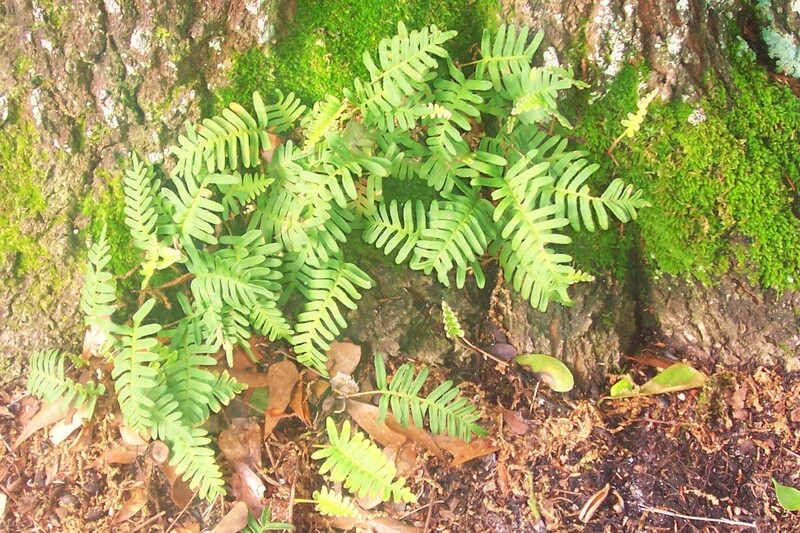 What can your fern do? If you don’t have a Fernando of your own, go find one and nurture your creativity. Last week, on April Fool’s Day (no joke), I signed my second book contract with Anaiah Press. Fortunately, there is no video footage of my happy dance. That would be awkward, almost as uncomfortable as admitting it happened in the first place. The “new book” is Corroded, a young adult, contemporary novel. 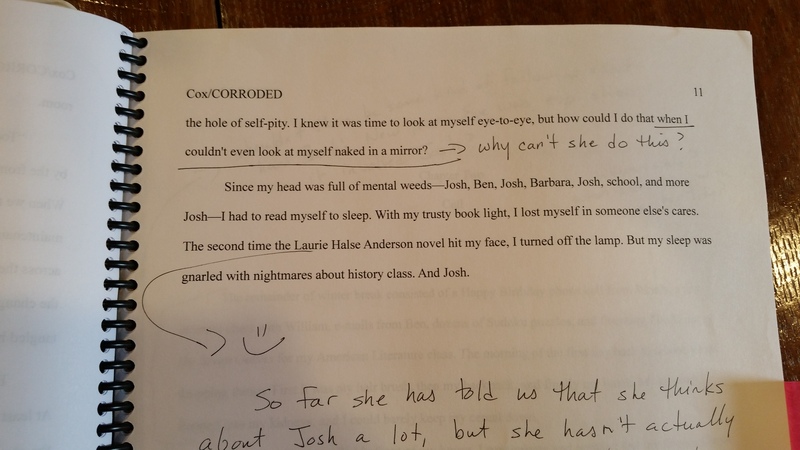 Corroded has been a labor of love for nearly a decade (and will continue to be worked upon this year, as I go through professional edits with the publishing company). The story has seen numerous critiques, several dozen drafts, and much support from friends and family through the years. It’s fitting that it will be released during Autism Awareness Month because the dual point-of-view is shared between main characters Mary and Ben, who has high functioning autism. For those paying attention, that’s Fortitude on January 12 and Corroded on April 12, 2016. Both novels will be available in e-book and paper formats on their respected days. In other words, “Don’t let your fortitude get corroded.” Everything happens in the proper time, in the right season (sometimes after years of labor). P.S. Ever in tune with my literary life, Fernando is flourishing.